Podmore Walker & Co started trading in Tunstall in 1834 and are recorded as having two factories, Newfield and Tunstall by Ward in 1843. They took part of the Pinnox works in Amicable Street sharing with Edward Challinor and added the Swan Bank works in 1853, previously vacated by Ralph Hall & Co four years earlier. Marine Archeology suggests some trading relationship between Podmore Walker and the Ralph Hall company particularly in the North American trade. The Podmore Walker partnership was expanded to include Enoch Wedgwood before the aquisition of the Swan Bank works and over the next 6 years went through a transitional period sometime trading as P.W.& Co, as P.W.& W. and as WEDGWOOD before a complete restyling in 1860 as Wedgwood & Co with Enoch Wedgwood becoming the senior partner. The company worked with earthenwares refining their product to a body that they marketted as Pearl Stone Ware which, more durable than earthware would have been fired at a higher temperature. They also in some patterns added colour to the glaze to sharpen the pattern. 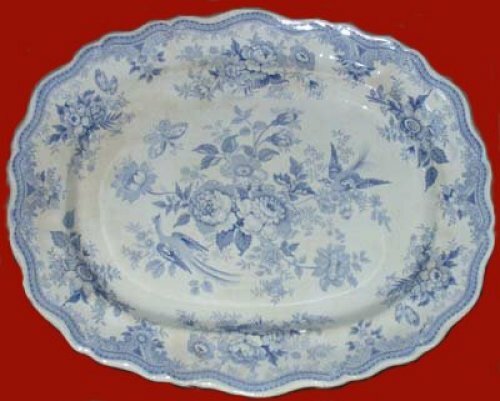 The company produced a distinctive romantic style of designs lighter in colour than most of the earlier transferware not only in blue but other colours including the use of two tints, which demonstrates how active they were in the North America Trade, since the domestic market only really supported Blue Transferwares. They opened up markets for their products in both the US and Canada, their British American series specifically for the Canadian market and registered the pattern named "California" on April 2nd 1849. The style of two of their patterns "Corean" and "Temple" were later echoed in the Art nouveaux Flow Blue patterns although at the time they were probably intended to look like ironstone. Their policy of originating new patterns meant that their expansion was not affected as some of their competitors were by the Copyright Act of 1842. The company are generally acknowledged as being the first producers of the "Asiatic Pheasants". Unless it was introduced by Enoch Wedgood it is unlikely that it was an "in house" design. Both the style of the pattern and the cartouche are such a departure from all of the other patterns they produced that the likelihood is that it originated in one of the transfer producing business'. A similar pattern (with a different border) and Cartouche called "Pheasants" was used by competitors John & Robert Godwin (1834 - 1866) of Cobridge. 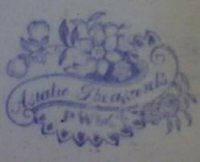 Podmore Walker & Co. were known to use patterns, not designed for themselves and produced both "Willow" and "Wild Rose (Nuneham Courtney)". How they came by the "Asiatic Pheasants" pattern remains a mystery but whilst they did not share any of their in house designs, they certainly shared the "Asiatic Pheasants" pattern before they restyled as Wedgwood & Co possibly as early as the late 1840's with Ralph Hall & Co. from whom they bought the Swan Bank works. 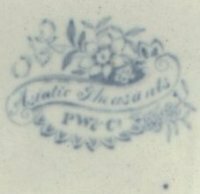 At the end of 1859 the Podmore Walker & Co partnership was dissolved and a new partnership titled Wedgwood & Co was formed to carry on the business. They produced many of the earlier partnerships patterns under the new label of WEDGWOOD & CO using "Asiatic Pheasants" as their principal design. Under a series of rationalisations they took over the whole of the Unicorn and Pinnox works after E.Challinor left and in 1862 sold the old Ralph Hall works at Swan Bank to the Burslem potters of Beech, Hancock & Co.